During a trip to the Bali Zoo, a visitor who goes by the name Vitaly R. decided to share some treats with one of the orangutans. What he didn’t know was that the animal was going to return the favor. Take at look at the video below. 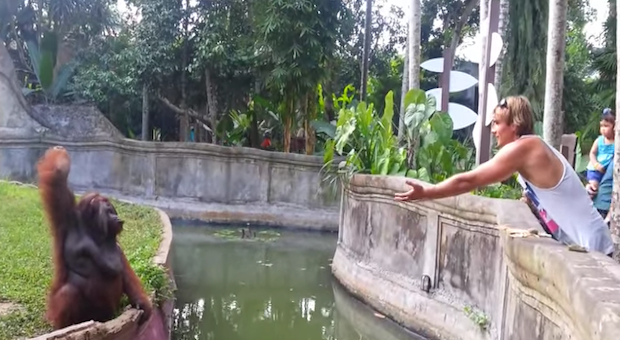 After throwing the primate a treat, Vitaly motions for the orangutan to throw something back. The orangutan reaches behind and grabs what looks to be a banana, hoists it for an extraordinarily long time, pondering if he really wants to give up his own treat, but then amazingly tosses the banana to the man. Even trade. This is one chimp with exceptional negotiating skills.